Leaders in the Alberta Main Street Program met in Lethbridge this week for their quarterly network meeting and some strategic training. The Main Street Program is a dynamic network of communities engaged in community regeneration through heritage conservation. As frequent RETROactive readers will remember, the network met earlier this year in Olds, and then also in May at the U.S. National Trust Main Street Conference in Detroit, Michigan. This meeting was the first for Old Strathcona since joining the program in May, and also the first for Camrose’s new Main Street Coordinator, Janet Hatch. Each community presented a brief update on the work of their program, including organizational work in Camrose and Old Strathcona, and streetscape initiatives and adaptive re-use projects in Olds and Wainwright. 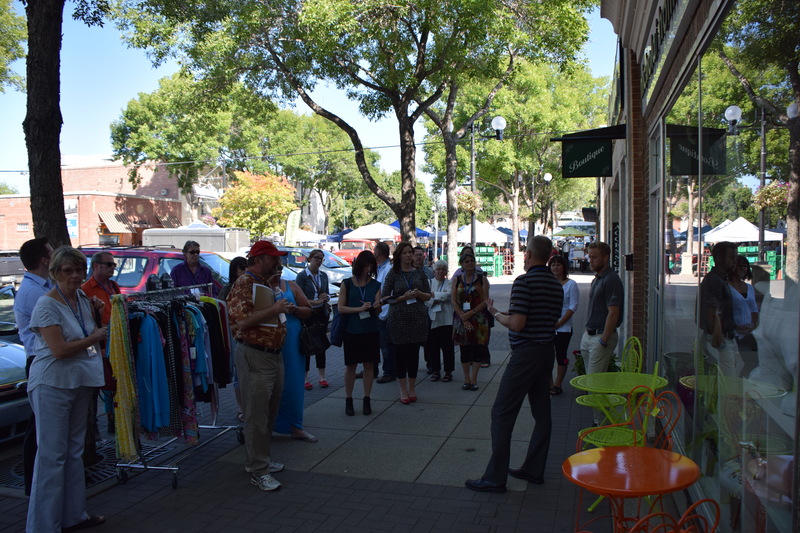 A walking tour was co-led by Ted Stilson, Executive Director of the Downtown Lethbridge BRZ and Main Street Coordinator, and Belinda Crowson, President of the Historical Society of Alberta. 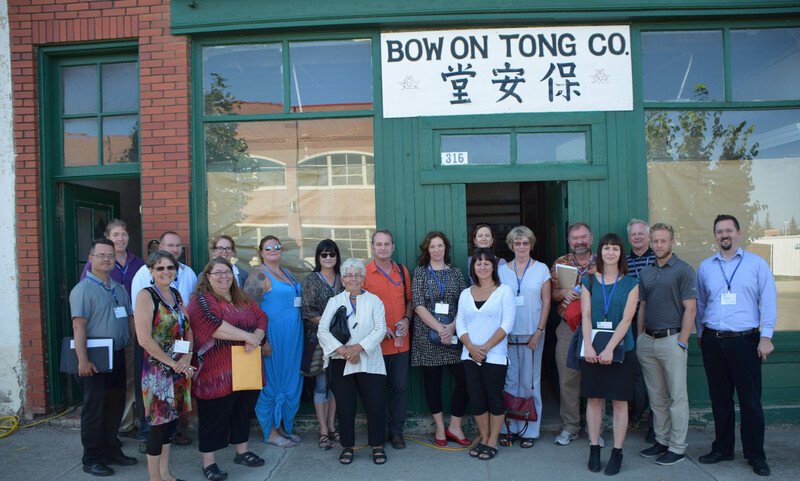 As we strolled through the historic downtown area, on a warm Farmer’s Market morning, Main Street leaders were able to see first-hand some of the significant heritage conservation work that has taken place in Lethbridge under the auspices of the Main Street Program. Main Street leaders take notes on how Lethbridge’s historic downtown has thrived. The group especially appreciated getting a tour of the work in progress on the Bow On Tong Building, which has also been featured on RETROactive. After the walking tour and lunch at Mocha Cabana, one of the City of Lethbridge’s Municipal Historic Resources, historically known as Bell’s Welding, the group participated in a lively training workshop led by Jim Mountain, Director of Regeneration Projects for Heritage Canada the National Trust. Jim Mountain, Director of Regeneration Projects for the Heritage Canada Foundation. Jim facilitated a very informative, interactive session on “The Role of the Main Street Coordinator.” His insights, gleaned from years of experience as a practitioner in heritage-led regeneration – both in Fort Macleod and across Canada – were beneficial for both our seasoned veteran Coordinators and also our newer leaders. Alberta’s Main Street leaders are already looking forward to the next network meeting and training session, to be held in Old Strathcona at the end of November. In the boreal forest, where big game animals were often hard to find, fish were a life-saving staple for thousands of years. Archaeological and historical records reveal a wide variety of fascinating angling techniques used by Alberta’s First Nations. To increase awareness of these practices and other elements of Alberta’s past, a collaborative team of the Historic Resources Management Branch, the Royal Alberta Museum, and the University of Alberta initiated the Heritage Art Series project. The goal is to create artwork that captivates the public in order to encourage the appreciation and protection of Alberta’s past. The second painting in the series is a symbolic depiction of a mother teaching her daughter about the relationship between people and fish. First Nations survived in Alberta by passing down immense amounts of knowledge, which this image by Jenny Keith illustrates. The artwork also celebrates the role that women make to traditional diets. Fishng was primarily a women’s task in Northern Alberta. Women needed to know where to catch fish, how to make nets, how often to check them, and when to repair them. The largest catch of fish was traditionally by gill net during fall spawning runs of whitefish. Whitefish were particularly important because they are high in fat, which becomes scarce in the north during long winters. Gill nets are long rows of interconnected squares that capture fish by the gills. What were nets made of before twine? Amazingly, women spent hundreds of hours weaving twisted willow bark or animal sinew into long nets. This is an example of a willow bark net from the Royal Alberta Museum. 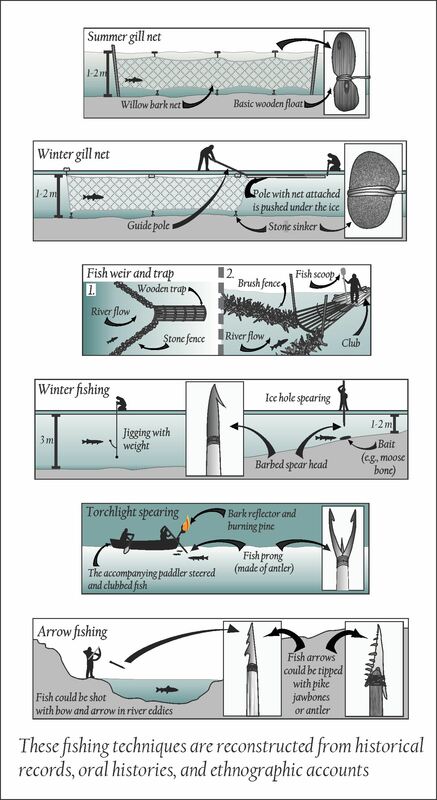 Gill nets were set across rivers or narrow channels during warmer months or were strung through holes under the ice in winter. Large fish were also shot with bow and arrow or were speared by canoe. Some First Nations made fishing arrowheads out of pike jaw bones: nothing catches fish better than fish! Jigging with hooks made of bone and wood was also done, primarily in winter. Hooks were baited with meat scraps, hair, feathers, and beaver oil. Fishing increased in importance when Europeans arrived. Fur traders in Northern Alberta made a living on pelts but they lived on fish. At Fort Chipewyan in Northeast Alberta, traders caught 33 000 fish from October to January in 1822. The ration was four fish a day (and a potatoe if they were lucky). Some northern trade posts even had to be relocated because they lacked good access to fisheries. 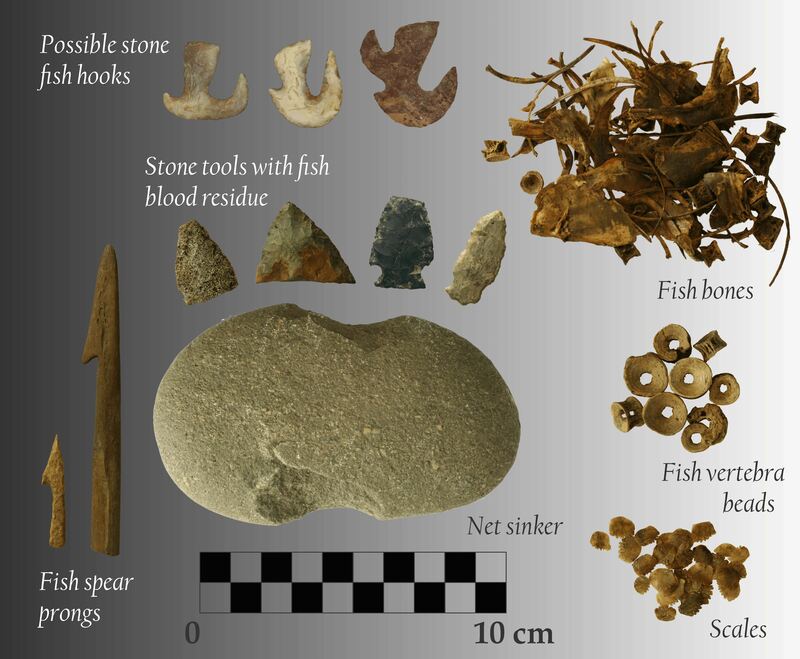 The archaeological record of fishing is sparse because fishing tools are often organic while fish bones tend to be fragile: very little of this survives in Alberta’s acidic soils. 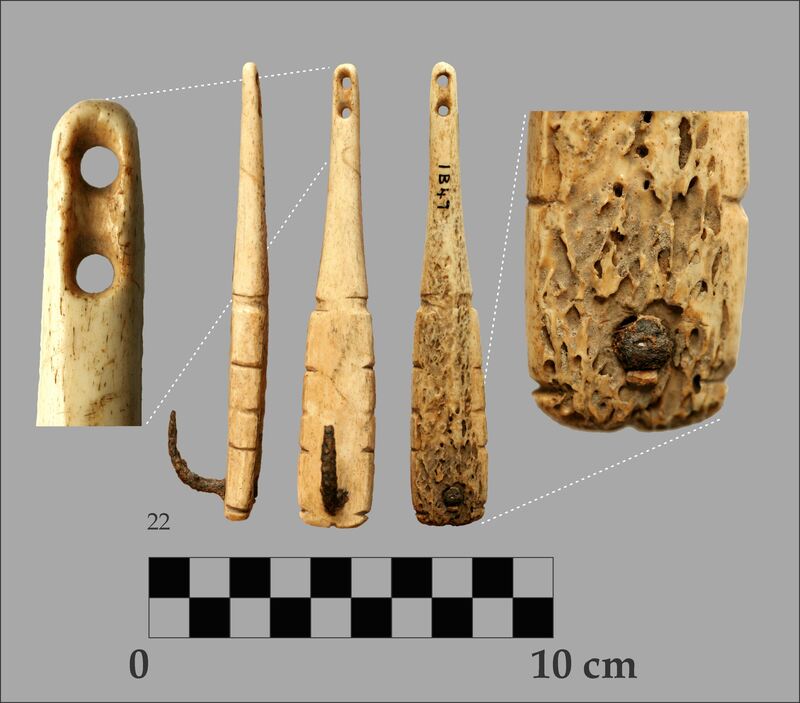 Some interesting fish-related fnds include possible stone fish hooks, bone prongs used on fish spears, sinkers (weights) that weighed down nets, and fish vertebrae that were drilled to make beads. This is a collection of pre-contact fish-related artifacts from Alberta that span several thousand years. Recently developed scientific techniques have also enabled the recovery of fish blood from the edges of stone tools like arrowheads and knives. Even though fish bones don’t survive, archaeologists studying blood residue have been able to determine that fish like pike, walleye, and whitefish were caught thousands of years ago. Lastly, fur trade forts have yielded an interesting array of early hooks. Some are entirely metal while others, like the example below, are a combination of bone and iron. This fur trade fish hook was found by Jack McIntosh at Dunvegan near Grande Prairie. When asked to imagine ancient life and food harvesting practices, people often think of men stalking mammoths or stampeding buffalo over cliffs. In reality, for much of Alberta’s human history, women have made just as important if not more important contributions to traditional diets. The painting above is intended to broaden perspectives of hunting and fishing practices while emphasizing the social dimension of food harvesting. People didn’t just survive by capturing food; they persisted for thousands of years by acquiring generations of knowledge that was passed down from parent to child year after year after year. Stay tuned for the next installation of the Heritage Art Series, which will present the physical record of cabins and their significance in Alberta’s early history. Written by: Todd Kristensen, Northern Archaeologist, and Dr. Jack Ives. Cooking Lake with its cool breeze was the place to be in the halcyon summers to the end of World War I. The wealthiest Edmontonians spent summers in one of the rustic cabins, swimming, sailing and canoeing or lounging at the docks. Others had to make do with day trips and special picnic outings to the beaches on its south shore. A group of prominent Edmontonians formed the Koney Island Sporting Co. Ltd. in 1894 to develop a small island located in a bay on the west side of the lake. It was an exclusive resort, complete with a log clubhouse nestled among the spruce trees. Members built cabins and erected docks. 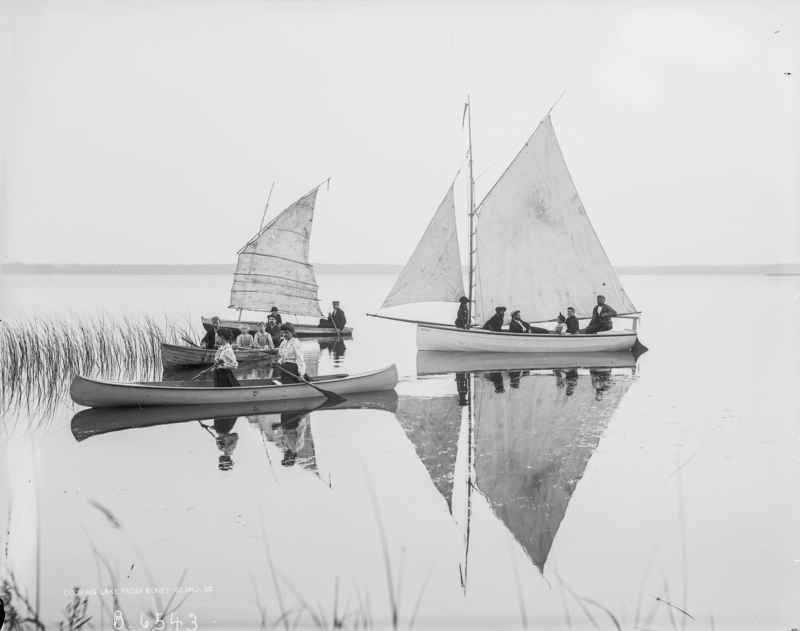 The serene lake waters were ideal for boating and one of the first club projects was a sailboat: the Mudhen. She was carvel-built using hand sawn lumber. Koney Island was an isolated spot: Dr. Goodwin, one of the club members, may have been surprised to meet Dominion Land Surveyor Ernest Hubbel who arrived to survey its shores in 1895. Goodwin lent Hubbel a club rowing boat to do his work. The island offered a “splendid rendez-vous” for club members, Hubbbel noted, and was “a tranquil and exceedingly picturesque spot.” Nevertheless, club members may have tired of rowing out to the island when they arrived dusty and hot from Edmonton, as in 1898 they bought a 20 foot gasoline launch that could carry 12 passengers. On the south side of the lake Sheriff Walter Robertson built a large lodge from logs and opened a resort in 1898. Here no company membership was required and holidayers could stay, enjoy the beach area and social functions at the lodge. The commercial resort slowly developed into the hamlet of South Cooking Lake, complete with post office by 1906. Cooking Lake really took off as a summer lake destination in 1909 when the Grand Trunk Pacific Line to Edmonton passed along its north shore. Day trippers came out from Edmonton on the morning train east, alighting at the small station of Cooking Lake. Part of the day’s fun was crossing the lake on the motor launch Daisy Girl that operated as a taxi to White Sand Beach on the south side at Ministik, where children built sandcastles before the evening’s return trip. Company picnics for employees were popular. The Esdale Printing Company picked a warm day in 1914 for its annual outing. Couples sat by the shore watching children swim or splash about. Some women had umbrellas for shade while other relied on their straw hats. A tug-of war competition was organized among the women, while a group of men spent most of the afternoon roasting an entire calf on a spit built over a camp fire. Everyone sat down at long trestle tables to enjoy the meal in the shade of the trees. Cooking Lake was a destination for outings on Empire Day (celebrated on the school day immediately preceding May 24). The day had beautiful fine weather in 1916, which must have sorely disappointed the young people in Edmonton’s First Presbyterian church group, who cancelled plans for a picnic and boat ride due to incessant rain the previous day. Church camps were held at the lake, and the Young Womens’ Christian Association had a bungalow at Military Point. By 1916 many Edmontonians had cabins at Cooking Lake. A taxi service was available from the city and motorists increasingly ventured out for the day. More facilities and accommodations were built on the lake shore, which had a graded “lake promenade.” Lunch could be enjoyed at Mrs. McMenomy’s “high class restaurant,” and canoes and row boats hired by the hour. Further along the promenade at South Cooking Lake, visitors played pool at Chris Falks’ ice cream parlour. Larger motor launches were evident on the lake in the 1920s and soon sea planes were landing on its waters, even before a seaplane base was built in 1935. The Cooking Lake Sea Plane Base was used recreationally as well as by bush pilots returning from the north. While other lakes around Edmonton enticed vacationers, Cooking Lake, the city’s first summer escape, remained popular into the 1960s. Water levels and water quality at Cooking Lake have always fluctuated: Koney Island became a peninsula in 1962. Sailors and swimmers became disenchanted during the 1970s. The summer of 2007 brought a record low-water level stranding the lake’s piers and cabins. Although waters have risen again recently, it seems unlikely that long summer days at the lake will ever be as cookin’ hot as they were a hundred years ago. Written by: Judy Larmour, Historian. For Eric Damkjar, Head of Archaeology, what the Archaeological Survey Section of the Historic Resources Management Branch does is akin to running a museum. Not a traditional museum, composed of artifacts encased in glass boxes under lock and key. Instead, archaeological specimens are scattered “across the landscape in the province, and [we]’re trying to look after those specimens,” reflects Damkjar. The Archaeological Survey Section has a mandate to protect and to interpret the province’s archaeological heritage. This necessitates striking a balance between protecting archaeological sites through regulating and redirecting development, and unlocking the knowledge of Alberta’s prehistoric past through excavation projects that, ironically, are triggered by development. Archaeological Survey maintains a database of some 40,000 archaeological sites in Alberta that includes known historic resources as well as lands that are “highly probable to have historic resources.” About half of those places have been further identified as high priority sites requiring protection. The provincial government relies on its relationships with different industry sectors, such as oil and gas, to become aware of potential risks to these sites. Those proposing development projects must check whether the potentially affected lands are included in the provincial database of sensitive areas, and if so, proponents must send Archaeological Survey their development plans. Damkjar and a team of archaeologists review the plans and decide if there is a need for a Historical Resources Impact Assessment (HRIA), which will recommend a course of action. An example of the excavation option can be seen in the town of Hardisty. Today, many pipelines that are built in the province converge there. Twelve hundred years ago, people drove bison into a buffalo pound near Hardisty. Next to that site, they processed hides and meat. This area, so rich in archaeological significance, is today heavily impacted by pipelines: one was put in last year, one is currently under construction, and another one is proposed. “Bit by bit,” Damkjar states, “these pipelines are eating into these sites.” The proponents of the pipelines, constrained by geography (namely, a nearby river) and unable to avoid impacting the sites, have been required by Archaeological Survey to perform a great deal of excavation work. “It’s turning into a very interesting site,” notes Damkjar, yielding a glimpse of a culture that archaeologists call Avonlea. The decisions that the Archaeological Survey Section makes are sometimes a leap of faith, says Damkjar. It’s not guaranteed that a protected site won’t be impacted, someday, by human activity; it is also not guaranteed that someone, eventually, will unlock the wealth of information that a protected sites holds for us. These are the challenges of planning for the future, notes Damkjar, but in the context of knowing that nonrenewable archaeological resources will continue to be threatened by development, the Province’s responsibility is to do what it can to protect them. Grier Block after rehabilitation was complete (July 2014). 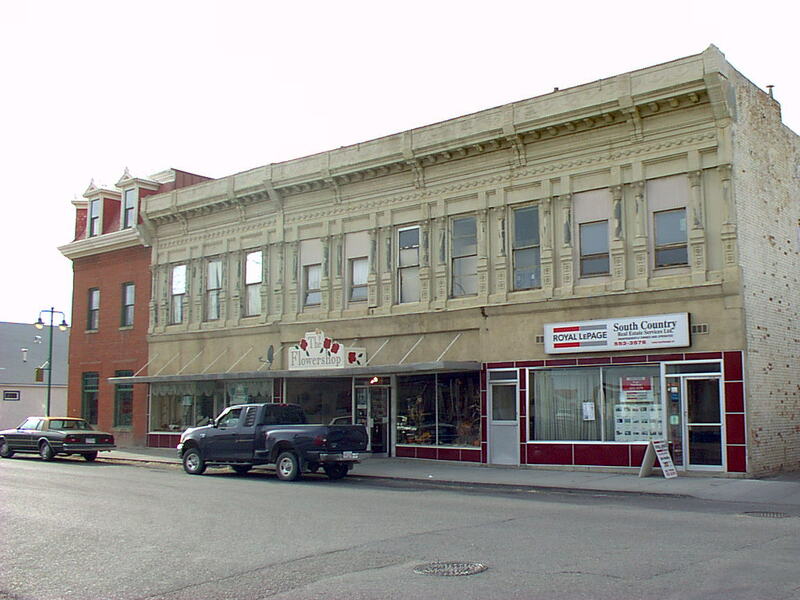 The Grier Block, built in 1902, was one of the first and largest commercial buildings in Fort MacLeod. It has one of the only pressed-metal facades in western Canada, highly decorated with an elaborate cornice and pilasters (columns between the window bays). Peter Maas recalls that by the early 2000s, when he and his brother Hans purchased it, the once-distinguished building was “pretty dilapidated.” The brothers spent seven years on a major rehabilitation (working full time, without pay, living on the premises) that brought the building back as a prominent and attractive contributor to Fort Macleod’s historic downtown. They recently added some long-missing and key elements, returning the building to its full glory. Unfortunately, the first-storey cast-iron pilasters had been missing since the 1960s, so the brothers only restored what was there at the time. 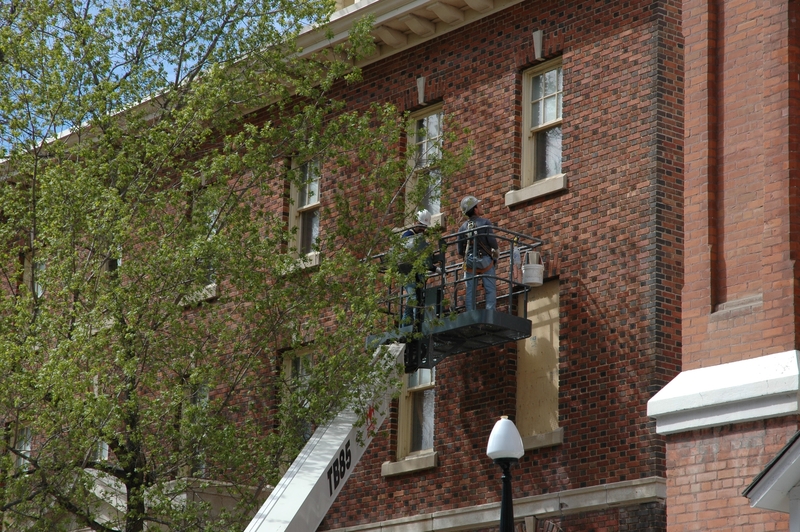 It was fairly common to remove decorative facades from commercial buildings during the 1950s, ’60s, and early ’70s, says Fraser Shaw, the Heritage Conservation Advisor for Southern Alberta. Ground-level elements corrode more readily. Also, at mid-century, out-of-fashion ornamented facades were often modernized at street level, as this one was, with expanses of plate glass windows with plain surrounds. The Grier Block in 2001, many years before the restoration began (November 2001). Now—thanks to their perseverance, resourcefulness, and the lucky confluence of the right people at the right time and place—those first-storey pilasters have been replicated and are back in place. It’s “the crowning touch…the icing on the cake,” says Fraser. The building is designated as a Provincial Historic Resource, so his role during both the original rehabilitation and this project was to verify the historical accuracy of the proposed changes and monitor the work. 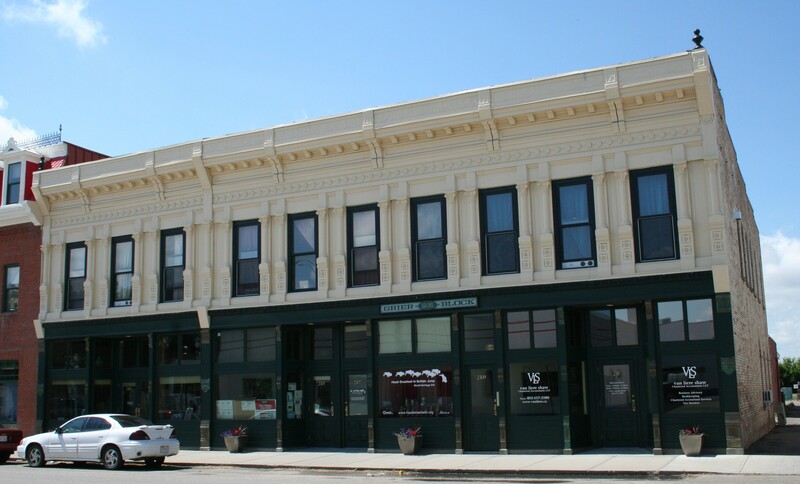 Buildings with Mesker Brother facades are plentiful in the U.S. East and Midwest, with numerous Western examples as well, especially in Colorado, Wyoming, Montana, and Washington. The Grier Block has one of only a handful of Mesker facades known to have existed in Canada, with two other Mesker facades installed in nearby Lethbridge—the Metcalfe Block (“Club Cigar”) and Lethbridge Hotel—no longer surviving. 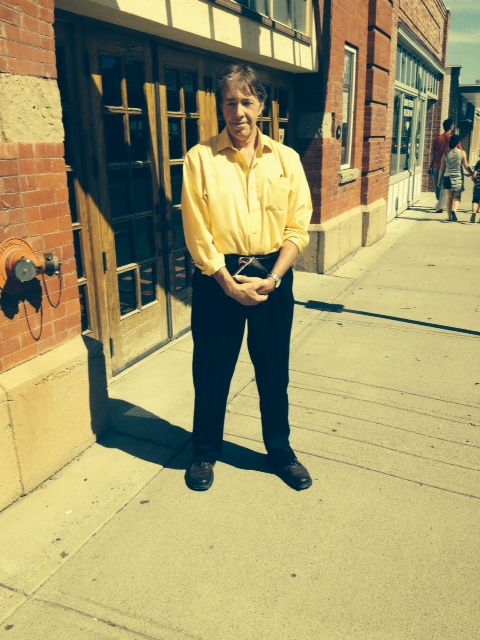 Fraser speculates that the developer of the Grier Block might have had U.S. connections, and benefitted from convenient cross-border rail service between southern Alberta and the U.S.
Over the years, Peter Maas had been hunting for Mesker storefronts with pilasters identical to those that once graced the Grier Block, hoping to replicate them. Specifically, he needed to find models for pilasters that are six inches and thirteen inches wide, each with a lower, a middle, and an upper component. All together, 33 individual elements needed to be produced to complete the lower facade. The original structural steel pilasters of the Grier Block were still intact. Outlines of old paint showed where the ornamental cast-iron pilasters had been, and there were even tool marks showing where they had been hacked off. The owners had historic photographs of the building and the Mesker Brothers catalogue to show how the missing elements should look, and Hirano had produced drawings. “But at the end of the day, you need something that’s full scale and more tangible” to create the accurate, full-sized building elements, Fraser says. During the rehabilitation work, the Maas brothers hired a carver to create the pilasters out of wood, but the result was disappointing. 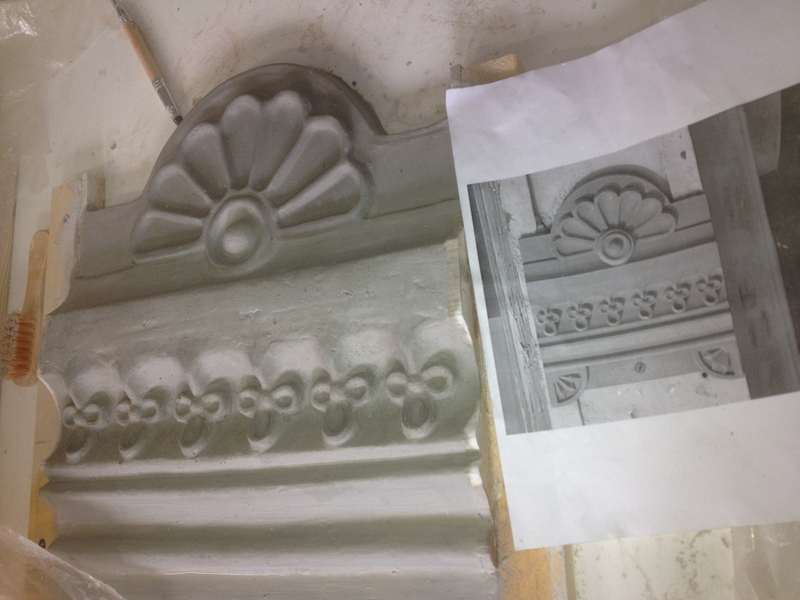 Later they located a Mesker Brothers building with one of the two needed sizes of pilasters while vacationing in New York State, and used those to create rubber moulds. 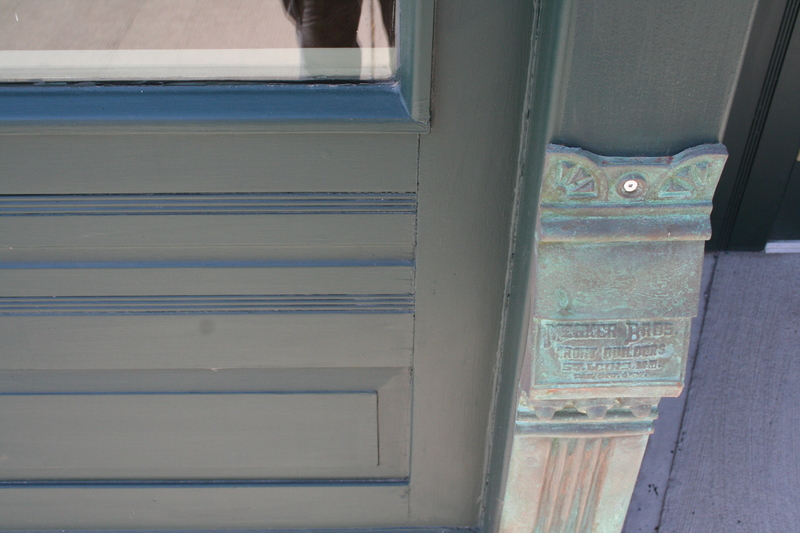 But because those pilasters had decades of encrusted paint, the resulting moulds lacked definition. One of the clay model prepared for the casting process (February 2013). Then everything came together last year when Peter was on vacation in Colorado. Always on the lookout for Mesker Brothers buildings, he tracked one down in the small town of Mancos, in southwestern Colorado near Durango. It had the six-inch pilasters he needed! While gazing at them, he struck up a fortuitous conversation with a passer-by. That was Collette Webster, a professional potter. She considered how to replicate the pilasters, then came up with a solution. Remarkably, the building owner allowed them to temporarily remove the pilasters. Collette was able to make plaster moulds of the three sections, and from those make clay templates that could be used for casting the elements in metal through the lost wax process. On the same trip, Peter found a Mesker Brothers building with the thirteen-inch pilasters on the main street of Telluride, Colorado. In that case, the pilasters couldn’t be removed, so he took lots of photographs. Collette referred to those and to the moulds for the six-inch pilasters to create scaled-up models in wood of the thirteen-inch pilasters. These could then be used to make the necessary plaster moulds and wax models. Some decorative detailing was still needed. As a potter, Collette was able to craft the missing roundels, florets, and other flourishes out of clay and then attach those shapes to the templates used to create the wax models. The sections were cast in bronze by craftsman Dimitry Domani at his foundry in Cortez, Colorado, then shipped to Sweetgrass, Montana, for Peter to collect at the border. Domani recommended using bronze rather than the original iron because it has the potential to develop an attractive natural patina over time, whereas the iron would need to be painted. The Grier Block’s new pilasters are now bolted into place, as they would have been historically, and also welded on “as an extra safeguard,” Fraser says. “In all, the project seems to have been a lucky convergence of passionate owners, Mesker buildings in Colorado to serve as templates, and a network of local (in southern Colorado) artisans to perform the work where the buildings were,” Fraser concludes. The project was assisted by a matching conservation grant from the Alberta Historical Resources Foundation. Today the Grier Block is fully occupied. On the first-storey are an insurance and a real estate agency, a stained-glass artisan, a visitor display and offices for Head-Smashed-In Buffalo Jump, and one residential suite; the second storey contains seven residential suites. “It’s a nice piece of history for the town,” Peter agrees. Hans Maas, a chef by training, had completed the historic rehabilitation of a smaller Fort MacLeod building as a “hobby,” Peter says, before tackling the Grier Block. Peter had experience constructing new buildings, but this was his first historic rehabilitation project. “I’m addicted to historic buildings now,” he says. “I find the historical projects are way more rewarding…You’ve got to go back to good material and quality workmanship.” He has since purchased and is now hard at work restoring Fort MacLeod’s Reach Block. 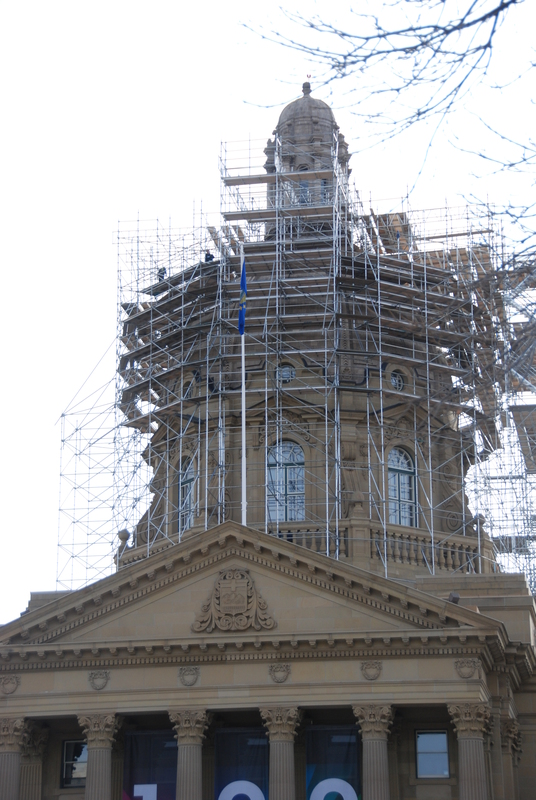 Scaffolding around the Alberta Legislature Building’s dome (2012). When Tom Ward stated doing heritage conservation work some 35 years ago, he had no idea if it would lead to long-term employment. 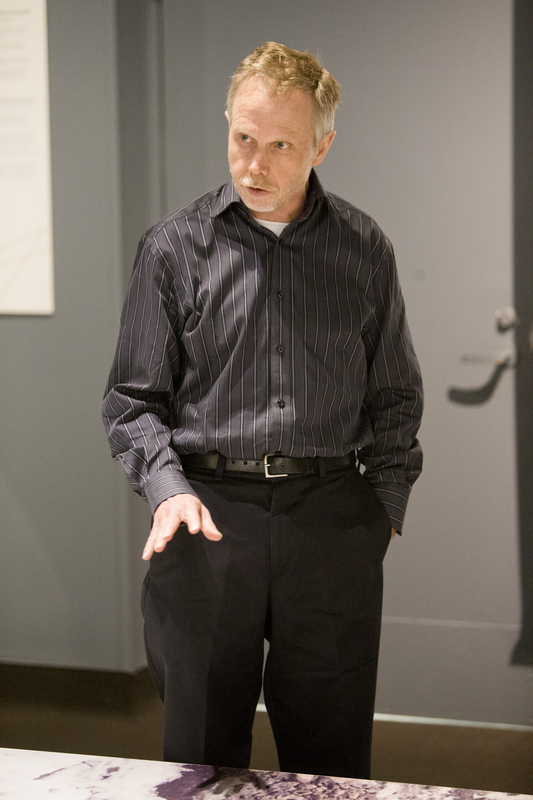 But he was hired early in his career to be part of the design team developing the Ukrainian Cultural Heritage Village east of Edmonton (a great learning opportunity, he recalls), and has been involved in heritage projects across the country ever since. Currently Ward is Manager of Heritage Conservation Advisory Services for the Historic Resources Management Branch, supervising five Heritage Conservation Advisers. The advisers, based in Edmonton and Calgary, cover all regions of Alberta. Their primary job is to ensure that changes made to properties designated as Provincial Historic Resources under Section 20 of the Historical Resources Act are done in ways that follow to the Standards and Guidelines for the Conservation of Historic Places in Canada. Inspecting the condition of brick masonry (2006). More than half of the advisers’ time is spent in onsite, face-to-face meetings with individual owners, groups, or developers. “Meeting people and seeing the historic places is really the great part of the job,” Ward says. The advisers provide technical guidance on the best ways to accomplish needed work; may recommend qualified architects, engineers, and contractors if needed; and also determine if the property owner might qualify for cost-sharing grant assistance from the Alberta Historical Resources Foundation. They ultimately produce a ministerial approval document package which satisfies Section 20 of the Historical Resources Act and allows the work to proceed. 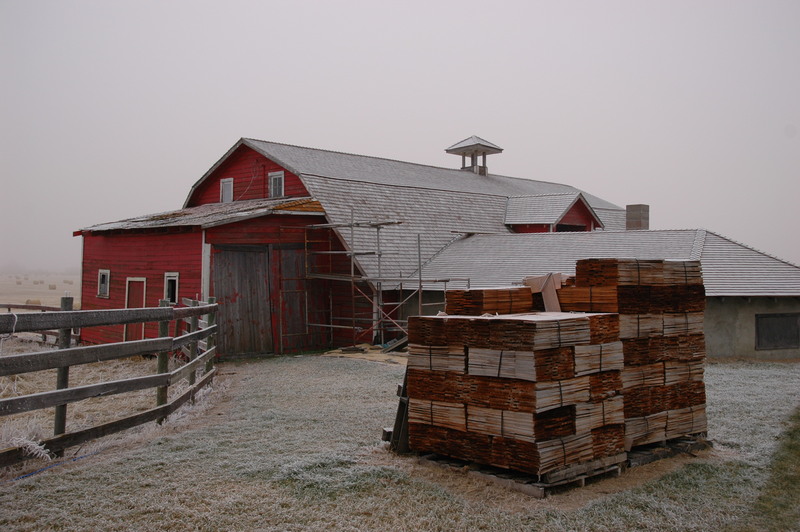 A historic barn in east-central Alberta being re-shingled (2005). The Heritage Conservation Advisers address the needs of privately owned properties as well as Alberta Culture’s historic sites which are also designated as Provincial Historic Resources. Ward also consults with Alberta Infrastructure when work is needed on Provincially owned heritage buildings administered by that ministry. Recently he was involved in planning conservation measures for the Alberta Legislature Building, especially repair and reconstruction of portions of its dome. Ward and his team also provide technical consultation to other programs of the Historic Resources Management Branch, such as the Municipal Heritage Partnership Program, and meet with property owners considering pursing heritage designation. The announcement of provincial funding to assist owners of historic properties affected by the 2013 flooding in Southern Alberta will almost certainly mean more “house calls” to owners now undertaking or planning repairs. “It’s going to be an additional workload, but everybody is keen to do it,” Ward says. He also sees this as a great opportunity to study the effects of flooding on sandstone and fieldstone foundations that are so prevalent in older buildings here, and determine best practices for restoration. The team holds occasional “retreats” to explore a technical issue in depth, through review of professional literature and discussion of their own onsite experiences. The next retreat will, of course, be about addressing flood damage. 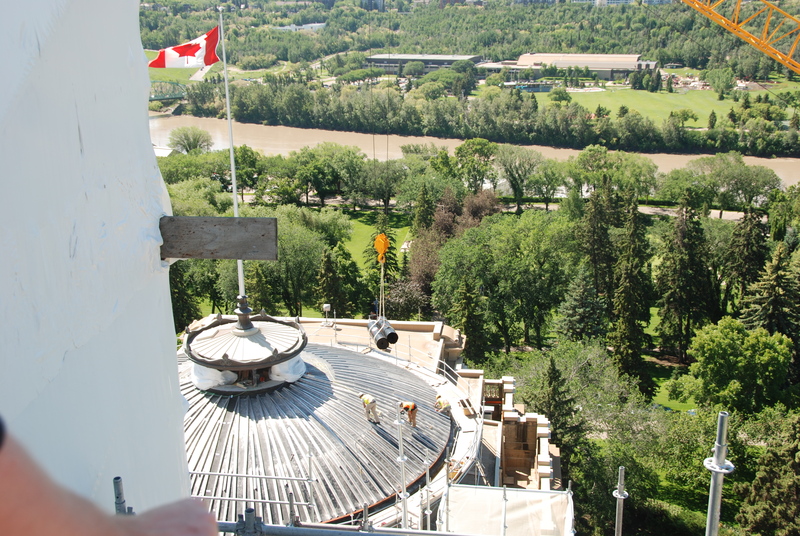 The Alberta Legislature Building’s dome being restored (2013). Ward says it’s typical of his team members responsible for the flooded areas that all were willing to work overtime, going to flooded areas as soon as they were allowed in, to advise owners on urgent matters, especially the best ways to dry out foundations. Did you know that one of the largest ecological catastrophes in Alberta’s human history was a volcanic ash fall? Around 7600 years ago the skies were blackened for many days and the prairies of Alberta were blanketed with roughly 15 cm of ash ejected during the Mazama eruption. To create awareness of this event and other important moments in Alberta’s past, a team from the Historic Resources Management Branch, the University of Alberta, and the Royal Alberta Museum initiated a project called the Heritage Art Series. The goal is to captivate public audiences with artwork that creatively explores ancient landscapes, relationships between people and their surroundings, and the enduring physical record of human activities. We hope the series inspires a desire to learn more about our province’s heritage and that a greater awareness of the past will instill a deeper respect for it. We’ll release the first four paintings in the series over the coming weeks with explanations about the significant events and figures that each scene depicts. The first painting (above) by Karen Bishop captures a surreal landscape of Southern Alberta as it would have looked 7600 years ago during the Mazama volcanic eruption. While the volcano that erupted was in Oregon (at modern day Crater Lake), it only took about 12 hours for some of the estimated 100 km³ of ash to reach Alberta. The ash smothered plants, contaminated fresh water, and would have filled animals’ lungs. Airborne particles would have caused intense lightning storms. Huge swaths of dead vegetation combined with frequent lightning led to widespread fires. 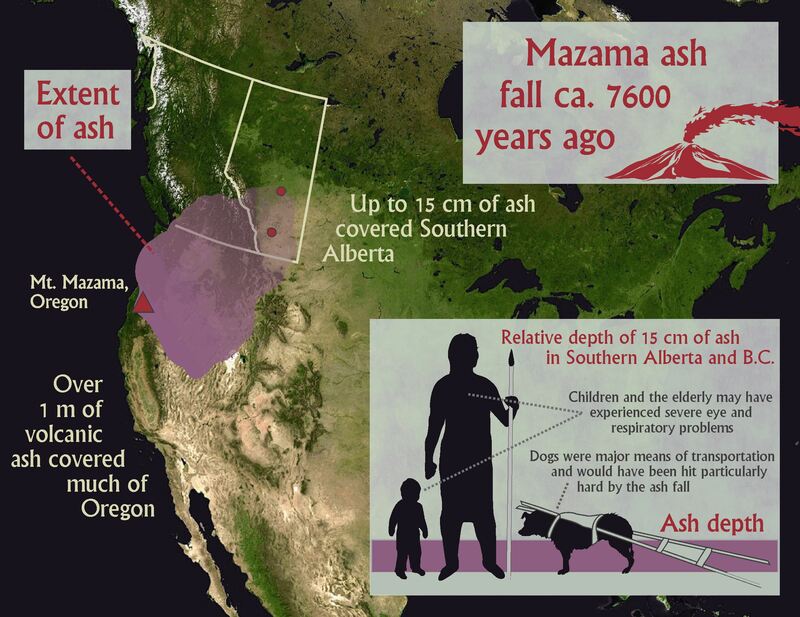 This map shows the spread of Mazama ash into Alberta. The inset depicts the depth of Mazama ash relative to people and dogs. 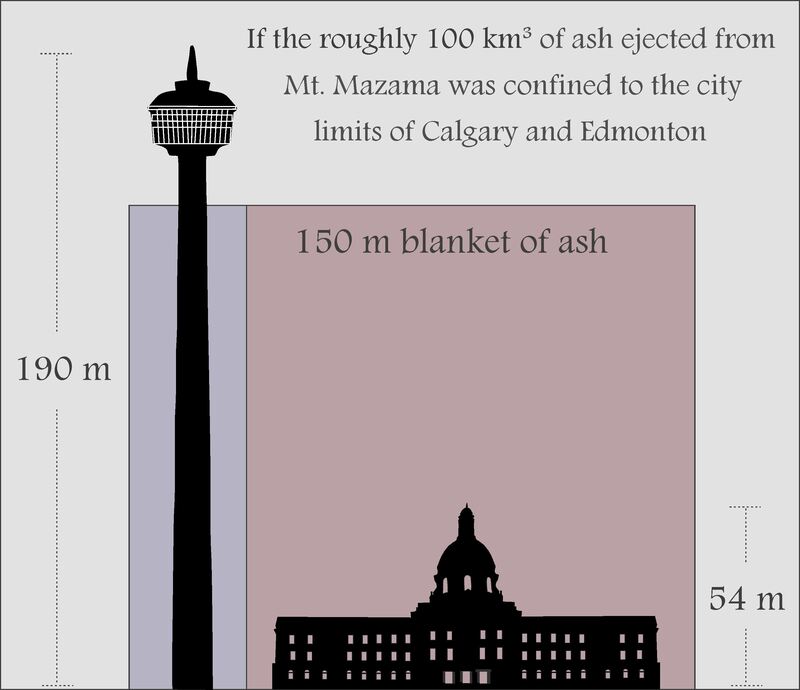 This figure depicts how deeply Edmonton and Calgary would be buried if all of the ash from the Mazama eruption were confined to the city limits. By studying micro-organisms and microscopic silica particles in soils and lake beds, scientists, including a team of ‘tephrochronologists’ led by Dr. Duane Froese from the University of Alberta, are learning more about the ecological impact and timing of volcanic eruptions in Western Canada. Climatic systems were altered by the relatively dense ash ejected into the atmosphere, the pH of soils and water bodies changed, and mobile animals like bison likely abandoned their territories for lack of fodder and/or drinking water. 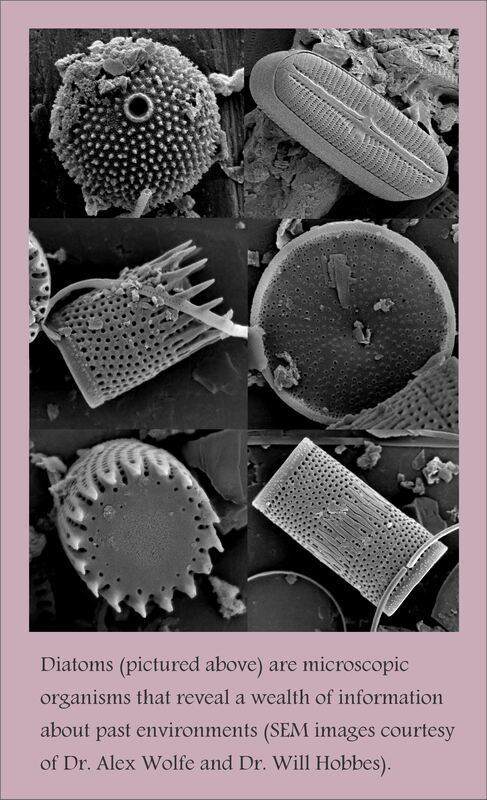 However, while the impact was widespread, preserved pollen suggests that plant communities rebounded rapidly. Overall, landscapes may have recovered fairly quickly from volcanic eruptions (on the scale of 2-10 years), but the effect on human populations was likely more pronounced. The archaeological record reveals that portions of the province were abandoned for several decades and possibly much longer. 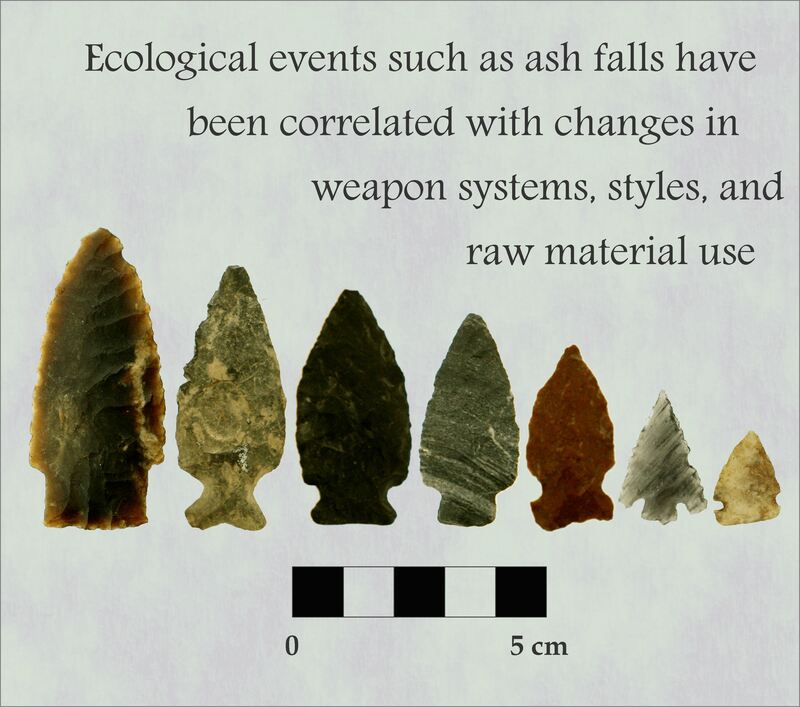 Notable changes in weapons and raw materials that were used for stone tools around the time of the Mazama eruption may be linked to this ecological catastrophe; the people that returned to once-vacated landscapes were either different from their predecessors or they arrived with new ideas acquired from their neighbours. This, and other large-scale eruptions in North America over the past 10 000 years, changed the direction of local human histories. New cultures, technologies, and social networks emerged after volcanic events. Despite the dramatic nature of volcanic eruptions, few people realize that Alberta has experienced them in the past and that other ecological catastrophes have influenced the development of Alberta’s past cultures. Palaeoenvironmental scientists and archaeologists have learned a great deal about past ecological events that, while educational, have more profound implications for the way we manage ecosystems and respond to the world around us. By studying the past, we can learn how to brace for the future. To learn more about the Mazama eruption and other palaeoenvironmental studies in Alberta, visit some of Dr. Alwynne Beaudoin’s research at the Royal Alberta Museum. 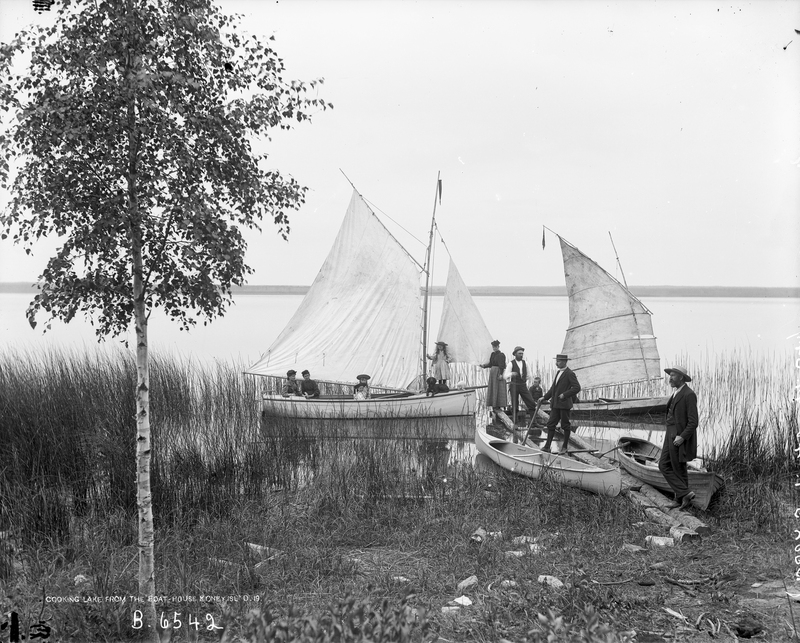 Stay tuned for the next installation of the Heritage Art Series, which will discuss the archaeological and historical records of First Nations fishing in Northern Alberta. Written by: Todd Kristensen, Northern Archaeologist & Alwynne Beaudoin, Royal Alberta Museum.